Encapsulated DS18B20 temperature sensor. Ready for use with EmonWRT and RPICT series. For connection on 3pin screw terminal. NOTE. 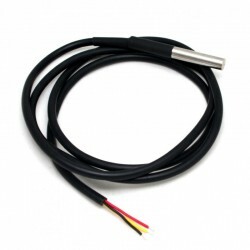 Legacy temperature probe with 3.5mm jack connector are no longer used. Contact us to get the probe fitted with this connector.